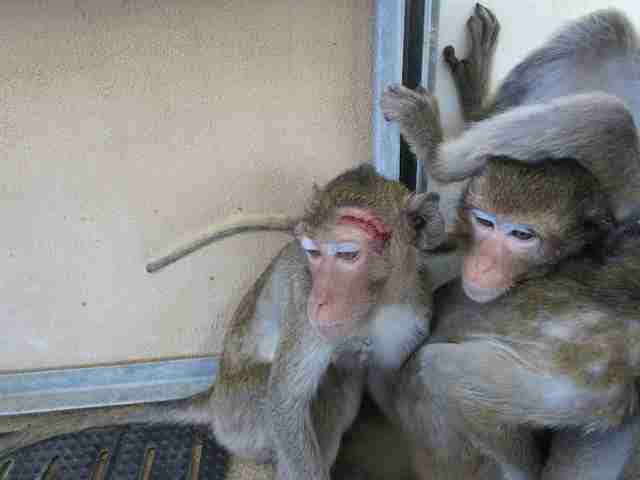 Lab monkeys at a primate facility in Florida often huddle together for comfort between invasive procedures. But at least one monkey has enjoyed no such companionship. Loretta, the target of bullying among the panicked monkeys, appeared to be the loneliest of the whole dejected group, according to eyewitnesses. She lost most of her hair because she was so stressed - and she had no one to turn to. 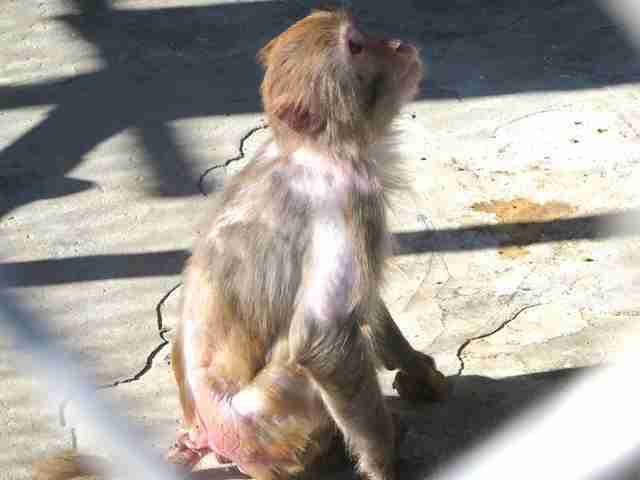 Loretta is just one of many monkeys who have come through Primate Products Inc. (PPI). In 2014, the company imported 1,000 monkeys to the U.S. from Asia and Africa - 63 percent of these monkeys were taken from the wild. According to an eyewitness video investigation, the primate dealer that supplies live monkeys to labs across the country - including those at the Army, the National Institutes of Health (NIH) and the Centers for Disease Control and Prevention (CDC) - is now under a magnifying glass for abusing animals. But for Loretta, the damage has already been done. When not enduring attacks from fellow monkeys, she suffered at the hands of PPI employees in the name of medical research. "After chasing them around the enclosure, facility personnel grab primates by their tails, then pull on their tails to remove the primates from the chain link they are hanging onto. This maneuver can result in trauma," a U.S. Department of Agriculture (USDA) report states. "After they are grabbed, and captured, the primates are then put into a pole net, sometimes with another captured monkey. On occasion, it was observed on the video, that these pole nets were lowered by the personnel which resulted in the captured primates hitting and dragging along the concrete ground." This treatment can cause serious damage. "[T]here was the real danger of dislocating the vertebrae in the tails and even breaking off portions of the tails," Nedim Buyukmihci, professor of veterinary medicine at the University of California-Davis, told PETA. "Long-tailed macaques do not have prehensile tails, hence the tails cannot withstand the kind of trauma being inflicted on them." 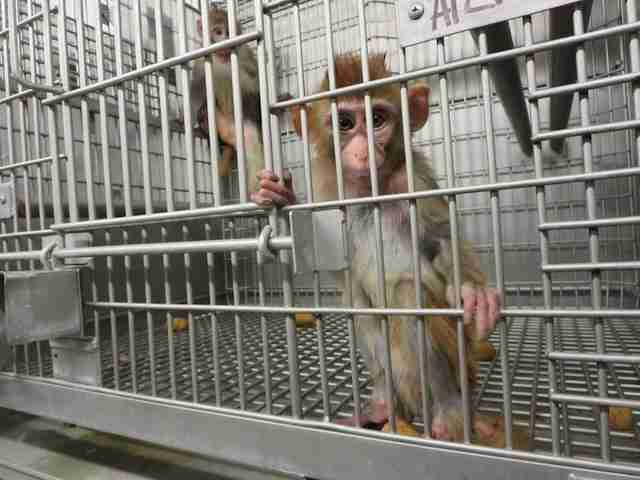 Once staff got their hands on the monkeys, the trauma didn't stop. 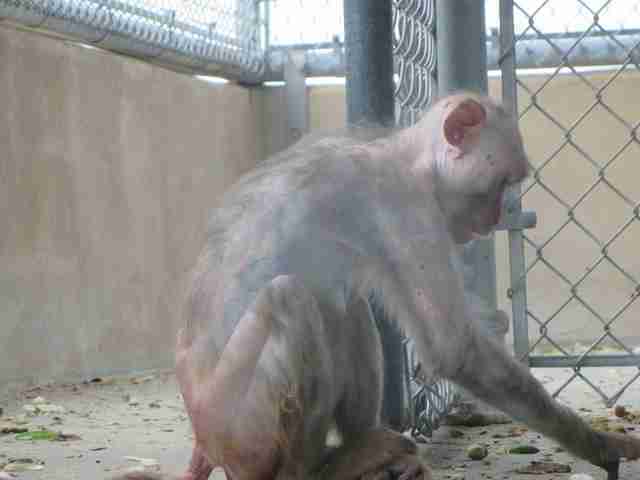 The animals were also observed undergoing painful procedures without anesthesia. The USDA investigated after PETA issued the video and confirmed the allegations. Government inspectors found PPI violated animal welfare regulations in at least 25 instances in May 2015. 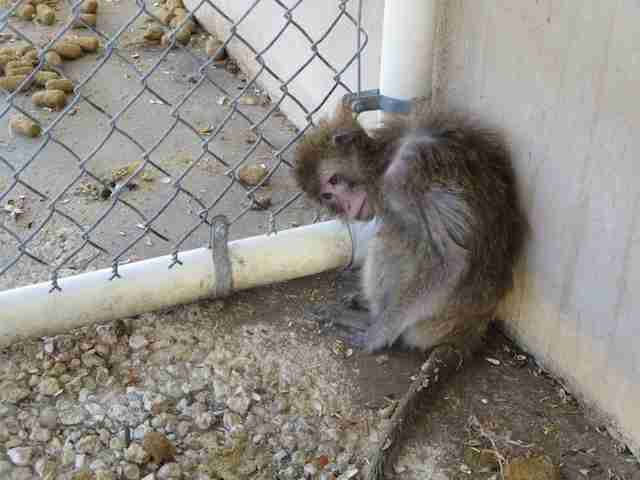 When investigators returned in August, PPI was cited yet again for unsanitary and unsafe living conditions for the monkeys. "Because problems documented at PPI were deemed to be so egregious, the USDA took the rare step of opening a formal investigation into the company, under the auspices of the USDA's Investigative and Enforcement Services," Alka Chandna, senior laboratory oversight specialist with PETA, told The Dodo. "That investigation is still ongoing." As for Loretta, like so many of the animals, no one outside PPI knows what's become of her. "She could still be at PPI or she could have been sold to a laboratory," Tasgola Bruner, media manager at PETA, told The Dodo. "She was in really bad shape." Primate Products Inc. did not reply to The Dodo's request for comment about where Loretta is today. You can help stop what happened to Loretta from ever happening again: Click here to sign a petition to shut this place down.